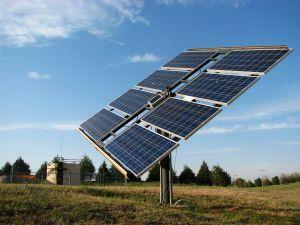 The advantages and disadvantages of solar power compared to other forms of renewable energy have been greatly debated. While obviously superior to some forms of energy, solar power's high cost and efficiency dependent on geography have limited its appeal. However, a large number of advantages also merit further development and even possible adaptation for residences. Solar energy remains popular because it is both a renewable and clean source of energy. These advantages along with the hope that eventually nations can use solar power to decrease global warming ensure its popularity. Solar energy is a true renewable resource. All areas of the world have the ability to collect some amount of solar power and solar power is available for collection each day. Solar energy is non-polluting. It does not create greenhouse gases, such as oil based energy does, nor does it create waste that must be stored, such as nuclear energy. It is also far more quiet to create and harness, drastically reducing the noise pollution required to convert energy to a useful form. Residential size solar energy systems also have very little impact on the surrounding environment, in contrast with other renewable energy sources such as wind and hydro electric power. Solar panels have no moving parts and require very little maintenance beyond regular cleaning. Without moving parts to break and replace, after the initial costs of installing the panels, maintenance and repair costs are very reasonable. The largest problem of using primarily solar energy is the cost involved. Despite advances in technology, solar panels remain almost prohibitively expensive. Even when the cost of the panels is ignored, the system required to store the energy for use can also be quite costly. Although some solar energy can be collected during even the cloudiest of days, efficient solar energy collection is dependent on sunshine. Even a few cloudy days can have a large affect on an energy system, particularly once that fact that solar energy cannot be collected at night is taken into account. While some areas would benefit from adapting solar power, other parts of the world would receive little benefit from current solar systems. Solar panels still require direct sunlight to collect large amounts of power, and in many areas of the world there are few days that would efficiently power a system. Although the benefits of solar power as an individual entity are fairly complex, currently using solar power is seldom feasible for residences. The cost of a system to service a home and store energy for use when the panels cannot produce energy is prohibitive for most common homeowners. Even if budgetary constrictions are disregarded, it is often difficult to find a technician who can complete repairs if they are needed. However, for those homeowners who are interested in supporting and using solar power, a solar powered roof vent or attic fan should be strongly considered. Attic fans, no matter how they are powered, can save significant amounts of energy through helping to moderate the temperature within a home. Solar powered attic fans, although slightly more costly than electric powered units, are incredibly cost effective once energy savings are factored into the purchase. Solar powered outdoor lights are also incredibly popular for homeowners who are interested in solar technology. In some conditions, they are the only reasonable choice for lighting an area. They are also popular with homeowners who do not want to add to the electrical load of their homes. While the advantages and disadvantages of solar power on a national level remain complex, the advantages for adapting small bits of this technology are clear when considering your home. If you are interested in larger scale applications of solar power and wish to try living off the energy grid, seek a professional who will be able to guide you through the process.